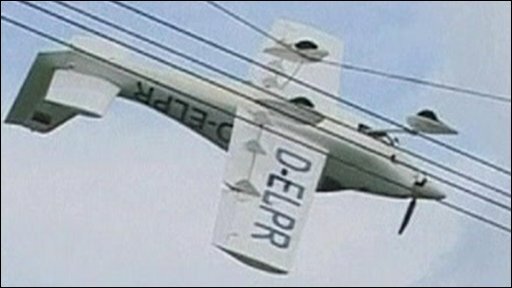 Two people have been rescued from a light aircraft which hit power lines near Durach, in southern Germany. It took emergency services two hours to get the trapped occupants out of the plane which was left dangling 30 metres (100 feet) above the ground. Rescuers on the scene believe the plane's undercarriage clipped the 380,000 volt power line shortly after taking off from a nearby airport. The pilot and passengers had to wait in the stranded plane while a cherry-picker was brought to the scene. It was decided that the downdraft from a helicopter would risk dislodging the aircraft.